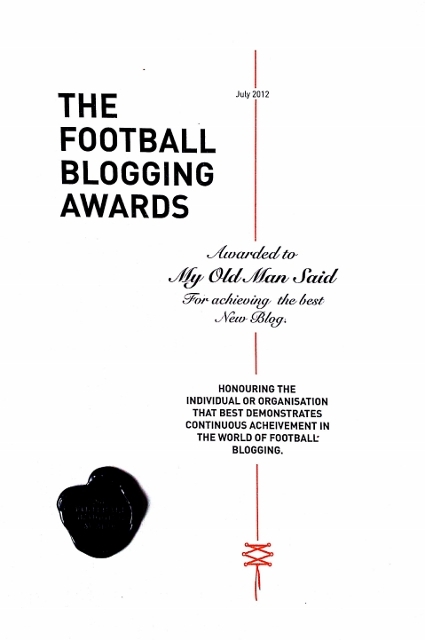 My Old Man Said ( www.myoldmansaid.com ) has been awarded the Best New Football Blog of the Year’ award at The Football Blog Awards 2012, which took place at the Masonic Guildhall in Greater Manchester this week. The award comes in the same week MOMS joined the Football Supporters’ Federation (more of that below). The winners were decided by a two-month long public vote with 40 entrants in the Best New Football Blog field alone. Over 10,000 votes were cast via facebook and twitter across the eight categories of the awards. As well as covering events at Aston Villa FC in a unique and original fashion, MOMS has redefined the use of a football blog in utilising it to also rally supporters into constructive action that has received national press coverage along the way. Such action, includes: helping to raise awareness of Villa captain’s Stiliyan Petrov’s fight against acute leukaemia, organising a tribute at Villa Park for Fabrice Muamba and also voicing MOMS Villa supporter’s feelings to their club in a newspaper advert; an action that the Guardian called a ‘unprecedented step’ of supporter action and solidarity. MOMS would like to take the opportunity to thank all the Villa fans who voted in the awards, as we consider this a victory for all Villa supporters, who despite a difficult last season showed their qualities throughout it and won respect from other team’s supporters across the country. Also, special thanks to the Villa supporters – Elliot, Niku, Greg and Louise – who collected the Best New Football Blog award on behalf of all MOMS Villa Supporters at the awards ceremony in Manchester. It was good to see some Villa fans drinking some champagne for a change! Also, this week, MOMS joined the Football Supporters’ Federation, which this year celebrates its 10th anniversary. The official supporters’ body is recognised by the FA and Premiership. It’s great to be associated with a supporters’ body that seems to truly reflect the thinking of most sane football supporters. So for any MOMS Villa supporters with any issues, it’s good to have an authoritative body to help, that has a voice and connections in high places. Also, as Aston Villa enjoys it’s USA tour and gets the word of Villa out in the states, MOMS likewise has gone international this month, getting the Villa gospel out there with a three-page feature in German culture bible Lodown magazine and also doing an interview for influential Los Angles-based World Football Daily podcast. The best news of all though, is it’s less than a month until Lambert’s Lions are finally released for real.